Disclaimer: I think that the Magic Creative team does excellent work, and a lot of it. In no way is this a criticism on their abilities. I think Jace is a boring character (despite efforts to make us care about him like his Origins story), so he as a protagonist is really hard to get behind for storytelling purposes. I think Jace is meant to be a Wish-fullfilment, sorta Marty-Stu, -ish character. 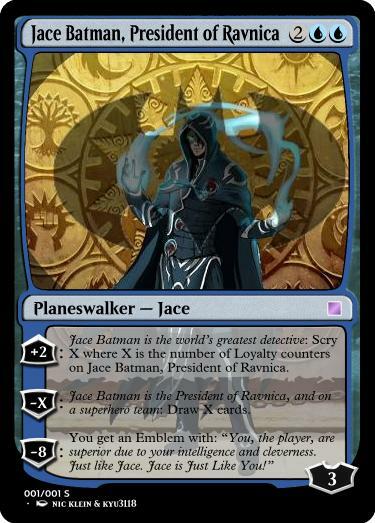 Why does Jace need to be the President of Ravnica, AND Innistrad’s Sherlock Holmes, AND a founding member and mental Batman of the (my apologies to Maro, who I do respect, but respectfully disagree with in this instance) Jace-tice League? Because the player can then pretend that that’s them. Good pyschology and marketing, bad for storytelling. I think it’s unfortunate that Jace is pushed because “Research says he’s the most Popular…” I think that a decent part of why Jace is “the Most Popular” is because he’s been made to be high profile and the most seen. Jace is popular because of his prevalence, not the other way around. I don’t dislike Jace because he’s popular, or because of his cards or his popularity alone. This is something Maro tends to throw back at Jace non-enthusiasts: <paraphrased> “some people just like to hate on things because they are popular>. I don’t like Jace because I don’t think he’s a good or interesting character. It’s also not about his cards (I’d actually LIKE to see some Jace cards that are more Illusion based rather than: Standard Value Control Engines). Granted some of this bitterness stems from two main events. A. The utterly crushing disappointment of the ending of the Return to Ravnica block storyline. Returning to one of the most excellently built worlds in fantasy gaming? — Great!. Catching up with the awesome characters on that setting? —GREAT! (I mean, I’d have no complaints with Teysa being the face of magic). There’s a secret mystery hidden at the end of a mystical maze and it’s so awesome and amazing that it’s even got Niv-Mizzet exited? — I. AM. STOKED!… what is it going to be? is it a PW spark? some sort of cosmic power to defeat Bolas? is a Bolas trap? I am so excited. THE PRIZE IS!!!!!! : …. non-Ravnican Jace is now the President of Ravnica? fuuuuuu………. B: Having Innistrad 2, a set I wasn’t excited for at first, be a really awesome pseudo-victorian mystery set, but having Jace be the Sherlock Holmes instead of a cool Innistradi Legendary Creature. Do something to make Jace actually interesting: was I the only one that picked up on some non-izzet chemistry with a certain izzet-allied plansewalker? That would be a bold character choice for a “flagship” character. Don’t just jam Jace into every Protagonist Role. Granted, he’s not the only face character, and they have been making Gideon into a bit of the Muscle Batman, or having other characters share the spotlight, but really it seems like Jace is the Main Main character. Bring Back Gerrard…nah, he was only slightly less boring, while being the least interesting member of his team. One more new deck tonight! I mulligan-ed a 1 land hand… into a 7-land hand. Totally kept it. Starting with a School of the Unseen (for style). I played Rayne on Turn 3 and she said “I Am Superman” (woman) via Pemmin’s Aura on turn 5. Prossh came out hard with a bunch of dragon-cost reducers (which did hurt his Kobold production). Ryusi also came out early, but Rayne was able to jump and miss Ryusi’s trigger. Ezuri was very dangerous with a Trygon Predator. I wizard-cycled for an Archetype of Imagination, but I kept it in hand for awhile. Ayli wiped the board of small CMC creatures and Artifiacts (which wiped my board, including a Strata Scythe). I recast Rayne with a Hermetic Study on her (surprisingly, I never drew cards via Rayne’s ability…) followed by a Diviner’s Wand and Alhammarret’s Archive. Jor Kadeen used an Elspeth, Suns Champion to wipe the big creatures, and Rayne pinged her to death. Ezuri had a large Glen Elendra Archmage, and had some Snake Tribal tricks for countering as well, and Prossh had used Hellkite Tyrant to steal Jor’s mana rocks, and was using Greater Good for card advantage and reanimation targets. I played a Stronghold Machinist and an Oath of Scholars (which I could draw 6 off of!) and, on turn 12 a Sphinx’s Tutelage and the Archetype. Jor Kadeen’s Purphoros got offed and he scooped (it was 10 minutes to closing). Ezuri had to leave, and I seemed to be in a good place until Prossh played Utvara Hellkite and out flew my flight school. It was still a fun game where Rayne was effective (despite not directly causing me to draw cards…). Oh, The theme is so stylish that I almost forgot that this deck has the additional restriction of being ALL PERMANENTS! No instants or sorceries. There are a bunch of cards that didn’t quite make the cut for various reasons (I’d love Musician as the band director). The second of three new decks tonight. I started with 2 forests, drew a third, and didn’t hit 4 mana until turn 7 (spoiler: we all die on turn 8). I wasn’t the only one with a slow start, Ayli 2 and Uril were both low for quite awhile…and this is despite the fact that with my 3 mana, I played Rites of Flourishing on turn 3! About the Deck: I have plenty of other decks about having giant hand-sizes, but Multani seemed like a fun voltron general with the added challenge of Shroud. There’s nothing to clever in this deck. It’s just have and give lots of cards, get Trample for Multani via global enchanments and try to win. Back to Back W/B decks (albeit separated by 2 weeks). I kept an awkward 3 land hand that lacked white mana, though I did play a Seraph Sanctuary early on. I got 1 white producer on turn 4, and played an Ashnod’s Altar. On turn 5 I missed a land drop, and sacrificed a Vampire Nighthawk to play a Talus Paladin for strategic reasons. Mogis had built up a Phyrexian Arena, Mogis himself, Repercussions and Tainted Remedy, those plus Mayael’s Lurking Predators mean that I had to Merciless-ly Evict all enchantments on turn 6. Ayli was mostly harmless. Mogis returned with an Underworld Dreams. My 7th turn I played two more Vampire Allies, though one got Fight-ed by a werewolf. Mogis was threatening with a Sarkhan in dragon form. Ayli wiped the board but it led into Mayael getting a Godsire, which smacked Sarkhan. Ayli drained us with an X=3 Debt to the Deathless. On Turn 10 I was able to March From the Tomb three of my Allies, sacrifice 2 to get the mana to cast a kicked Blood Tribute, halving Ayli’s large life total and bumping me from 17 to 41. Meanwhile I had cast Selenia and bounced her once. I had to cast her a second time from the command zone (I eventually bounced and recast her 3 more times). Ayli wiped the board again. Mogis uses Palace Siege to continue to grind us, and Praetor’s Grasped away a Vampire Impostor from me. On turn 12 I try to Congregate for big life, but only end up with 12. Ayli now has a Debtor’s Knell. Mayael is hanging on with an Elderscale Wurm, and other big Wurms (Novablast, Worldspine!) but can’t mount an offensive. Ayli continues to reanimate a Godsire via Puppeteer Clique, attack me, get a token, and sacrifice the Godsire for life. Mostly I just block and bounce Selenia. I try for a Defiant Bloodlord on turn 15 but by this point Ayli has a mess of a board and kills us all. About the Deck: This one also grew out of the “Build Karlov, Rebuild Vish-kal, Build Ayli” project. When I realized that I basically had every other BW commander built (assuming I use old Ghost Dad as backup-general for my Teysa #2 deck), I knew I had to build Selenia. Ayli had to have the B/W Allies cut, and they found a home here, cementing the Unlikely Alliance of Angels and Vampires that make up this deck. It’s a deck that benefits from life-gain, but is not a Life deck (the life is really to stabilize and let me bounce Selenia). Seal of the Guildpact is a star, along with the one that does the same thing for life. This one isn’t really a reanimator deck either, aside from the Allies sorcery. I kept a 4 land hand, all of which entered the Battlefield Tapped (my Tainted field tapped for colorless the bulk of the game). I played Ayli on turn 3 and Sigil of the new Dawn on turn 4. Isamaru came out early and had an Umezawa’s Jitte, which spent most of the game on a flying double striker and got as high as 15 counters on it. Mizzix was ramping and Horde of Notions was color fixiing. I didn’t play another spell until turn 8, when my Rhox Faithmender got countered by Mizzix. I responded by Ashes to Ashes-ing Mizzix and Melek out of spite. I was down to 23 life, having been hit for 6 by the doublestriking Jitte-holder a few times. Mizzix stole Isamaru. On turn 9 I cast Serra Avatar. I looked around to make sure it was good, and went to sacrifice it to Ayli when Mizzix said he was killing Ayli in response to the casting of of the Avatar. I rarely argue about timing and stuff, and I’m usually pretty chill about Takesies Backsies (though I did turn down the opportunity to take one earlier in the game), so Ayli died, but not before I shuffled my Avatar and went back up to 46. On turn 10 I played a Vizkopa Guildmage and a Nomad’s Assembly for 7. I was setting up to win via a Congregate/Guildmage next turn, but Isamaru cast rout, and my Assembly failed on the next turn. Mizzix was able to exile the Jitte, though Isamaru gained 24 life from it. Turn 11 I cast a Whip of Erebos and a Disciple of Griselbrand, and then someone Cyclonic rifted. Turn 12 I played down my Whip, Sigil and Disciple. Mizzix had 5 Bringers of the Red Dawn thanks to Horde of Notions and a Rite of Replication. After a Windfall, I amazingly got my Serra Avatar back in hand, though I lost some good stuff. I replayed Ayli and started doubling my life (using Sigil of the New Dawn to beat Avatar’s shuffle trigger). Mizzix was doing Shenanigans with his army of bringers (and thankfully Ayli can’t sacrifice herself to herself). A Curse of the Swine was aimed at Horde of Notions board and followed up with a Contagion engine that gave Swine Flu to all of the pigs. I doubled and redoubled up to 264, patiently waiting to get to 15 mana. I was amazed that there was nothing stopping me. I hit 15 mana on turn 15 which was enough to cast the Avatar, Whip in the Guildmage, activate it and sacrifice the Avatar to Ayli, putting me up to 528 and everyone else down by 264. In a game where everyone was playing really good stuff, and I only cast 3 spells in the first 8 turns, it was a fun surprise to win. About the Deck: This deck was in the works as soon as I reconfigured my Vish-Kal deck to scavenge cards for a Karlov deck. Since that one was about incremental life gain, I had many big-gain cards left over. Ayli was announced, and I knew what I needed to do. This one has a bunch of life-doublers, and the goal is to get a big life total and use it for value or for winning. As it was being built, I realized that it needed some token creatures to make use of Ayli’s second ability, so I rethought it a little bit. It plays Boonweaver Giant and 2 combo auras (Shade’s Form and the other one), because I love Boonweaver. 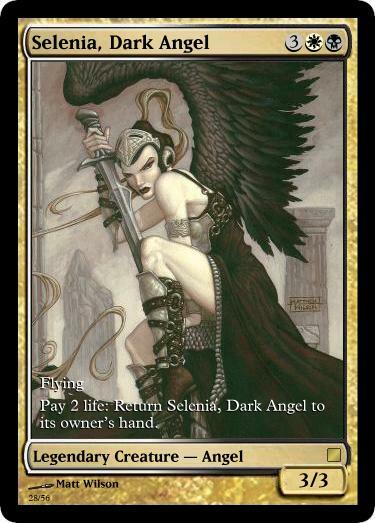 It initially had a B/W allies theme to it, but there wasn’t room for that, and in building this one the rest of the cards that didn’t get used spilled over into a Selenia, Dark Angel deck that is nearly complete.